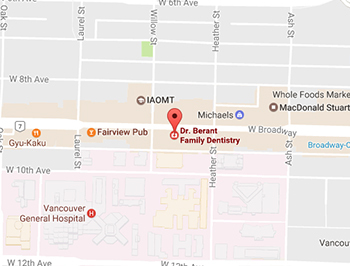 The Berant Family Dental Practice is located in the Fairmont Medical Building at 750 West Broadway. There is an outdoor parking lot conveniently located on the second level, with an entrance from Willow Street on the west side of the building. The bus stops in front of the Fairmont Medical Building for the #99, #50 and #9 bus routes. For people using rapid transit, the Fairmont Building is two blocks west of the Canada Line City Hall Station at Broadway and Cambie. For your convenience, the office is open one hour later on Tuesdays.